How can we help Judaism’s rich textual tradition resonate with children growing up in the age of digital media? What are the ways in which our changing world will impact the development, governance, and effectiveness of our nonprofit and communal institutions? In a professional environment that increasingly favors mathematics, science and engineering careers, what type of education and skills development are necessary to enable our students to compete on the global stage? These are just a few of the complex questions the Yeshiva University community tackled at “YU and the World of Tomorrow,” a unique conference on Sunday, October 22, that convened scholars, educators and leaders from across the University and broader community for panel discussions on some of the most pressing issues facing the world and the Jewish people. More than 500 students, alumni and members of the YU community attended the event on the Wilf Campus, which featured more than 40 presenters during a series of breakout sessions covering topics ranging from textual learning to social media to careers in an automated world. Rabbi Glasser also announced a new initiative that will present the YU and broader community with tools to consider and discuss many of the challenges that would be dealt with over the course of the day. Called YU Ideas, the website will leverage the University’s vast interdisciplinary resources to frame conversations through a series of posts, each tackling a new topic relating to one of four themes of central significance to human society: education, the marketplace, leadership, and values in a rapidly changing world. 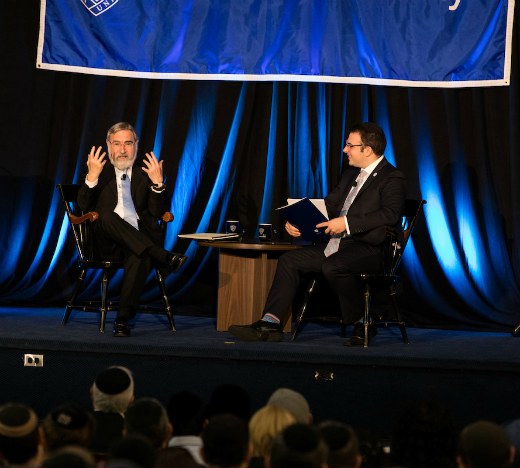 The conference opened with an interview of Rabbi Lord Jonathan Sacks, former chief rabbi of the United Kingdom, award-winning author and theologian, by Rabbi Ari Lamm, special advisor to the president at YU. The discussion covered topics such how social media has impacted Jewish faith, the future role of YU, and the conflict between concepts of universalism and particularism as they unfold in today’s political climate. “Judaism must go out and show that is not an either/or, but both/and,” said Rabbi Sacks. In one breakout session, Alyssa Herman, YU vice president for institutional advancement, led a panel discussion on “Non-Profit Disruptive Innovation” with Patrick Schmitt, CEO and co-founder of Keshet Starr, managing director of the Organization for the Resolution of Agunot; and Daniel Perla, director of Financial Vitality for Prizmah: Center for Jewish Day Schools. The panel discussed how non-profit organizations can best garner all available resources to change and support society. Speakers from across the University and a diverse range of professional fields led conversations at the conference, including Sarah Hofstetter, chief executive officer of 360i; Professor Avi Helfand, associate director of Pepperdine University’s Diane and Guilford Glazer Institute for Jewish Studies; Bruce Taragin, managing director at Blumberg Capital; Dr. Selma Botman, provost and vice president of academic affairs at YU; Dr. Rona Novick, dean of the Azrieli Graduate School of Jewish Education and Administration; Rabbi Yaakov Neuberger, I. Meier and Henrietta Segals Professor of Talmud; Rabbi Menachem Penner, The Max and Marion Grill Dean of YU-affiliated Rabbi Isaac Elchanan Theological Seminary; Dr. Danielle Wozniak, The David and Dorothy Schachne Dean of the Wurzweiler School of Social Work; and Rabbi Mordechai Willig, Rabbi Dr. Sol Roth Professor of Talmud and Contemporary Halakhah, in addition to many others. For more information on the conference and to view video recordings of the sessions, visit www.yu.edu/worldoftomorrow.